Safefood 360° is designed and structured to reflect what has become the accepted structure of most Food Safety Management Systems (FSMS). The module has been refined and the User Interface enhanced in subsequent versions so that it now places amongst the highest in global standards and operations by food businesses. The intuitive and easy to navigate format means that users quickly become oriented to the system and can logically source the module or area that they need to conduct their business. Furthermore the application was designed with scalability in mind. It can easily be updated and changed without impacting the overall system. Additional modules can, and are, added on as required and the interface can also be honed to reflect your specific business needs upon request. The User Interface is a simple yet elegant blend of aesthetic and performance qualities to work that retains a minimalistic feel. As a result the dashboard remains uncluttered and unencumbered with only menus and functionality that are required, and specific actions are easy to find in a logical and sequential drop down box. Solution Title: The name of the currently running solution, e.g. ‘Food Safety Management Solution’, ‘Hygiene Management Solution’, ‘Supplier Portal’, etc. Site Name: Here the name of your plant of operation will be reflected if you are a multi licence vendor. For single licensees the dashboard will display your company’s name. The site viewed can be chosen through selecting your name from the menu bar. Centers: Display the main origin points of all actions in the program. When you wish to instigate an action such as implementing a program or viewing reports you must source your action from the main center. For example management processes such as Complaints and Product Recall are to be found in the Management center whilst prerequisite programs such as Pest Control and Training can be sourced in the PRP control hub. Modules: Are the option through which each individual task you seek to accomplish can be completed under. Menu Bar: Displays the current profile logged in, an option to log out, and the help center wherein the user guide, email support, academy, announcements and idea submittal forms are located. 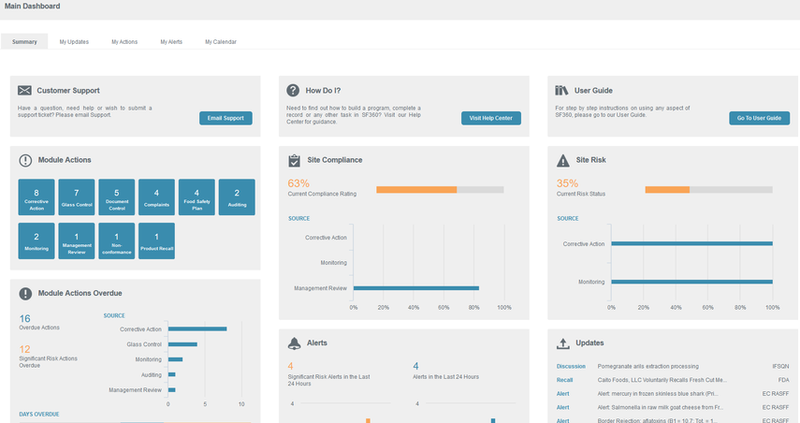 The dashboard is the main landing page for the user and will be the first thing they see when logging in to the Safefood 360. 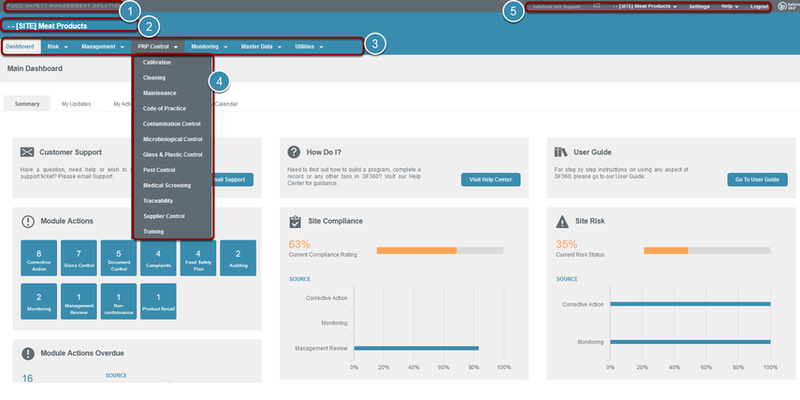 Site main dashboards provides out-of-the box real time oversight of risk and compliance across your business operations. These dashboards contain several smaller 'Dashlets' which focus on an aspect of the site. Hovering over the heading of each dashlet, you will see a Tool Tip which describes the purpose of the dashlet. 1. Information and Support: The first element at the top of the dashboard allows you quick access to contact customer support, the User Guide and Help Center. 2. Status: The second element the user will notice are the two summary rating dashklets covering Compliance and Risk. These present a summary of all current data in the site to let users know if the site is doing what they are supposed to be doing and if there are any issues open increasing risk. 3. Key Data and Trends: You will see dashlets which present to you the most important activity data which typically you need to know and action day to day. Other dashlets provide you useful information on food safety updates and Safefood 360 announcements. The structure and layout of each module in Safefood 360° is identical. The result is that the program is simple, free of complexity, and easy to navigate to ensure that the learning curve required to navigate the software is minimalised. Module Title Bar: Contains the name of the Module / Programme / Record / Entity that is currently being viewed. The example above is of the ‘cleaning’ module. Module Action Buttons: Reflect the actions that can performed within each module. These are the main tasks that can be added to the programme under which all tasks will be administered against. Module Tab Menu: The user can quickly alternate between the various sections of the module. The specific actions in each tab can then be performed within the module. Module Tab Data: Display when selected in the Module Tab Menu. This is the content of each tab. The descriptions for each tab are below in sequential order. The Summary Tab in each module is divided into two sections. It displays a list of the completed actions for that module. The left displays the Key Performance Indicators for data in the module whereas on the right there is a graph representing the most important KPI in that module. The Complete Tab contains a list of all the completed records in the module. Safefood 360° is slowly rolling out new grids for the Complete, Plan & Actions tabs. This is currently released for the Monitoring Module. Click here for more information. A list of the programs in the module showing their repeat frequency and next due date. See the article on Programs and Plans for further information. Safefood 360° is slowly rolling out new grids for the Complete, Plan & Actions tabs. This is currently released for the Monitoring Module. Click here for more information. Contains a list of any incomplete records for the specific module. The Action Required column shows the exact status of the record and indicates to the user where in the process the current action is. The article on Workflows provides further information if needed. Safefood 360° is slowly rolling out new grids for the Complete, Plan & Actions tabs. This is currently released for the Monitoring Module. Click here for more information. The Reports Tab contains any and all reports that can be generated from the data inputted for the module. Refer to the chapter on Reporting for further information.